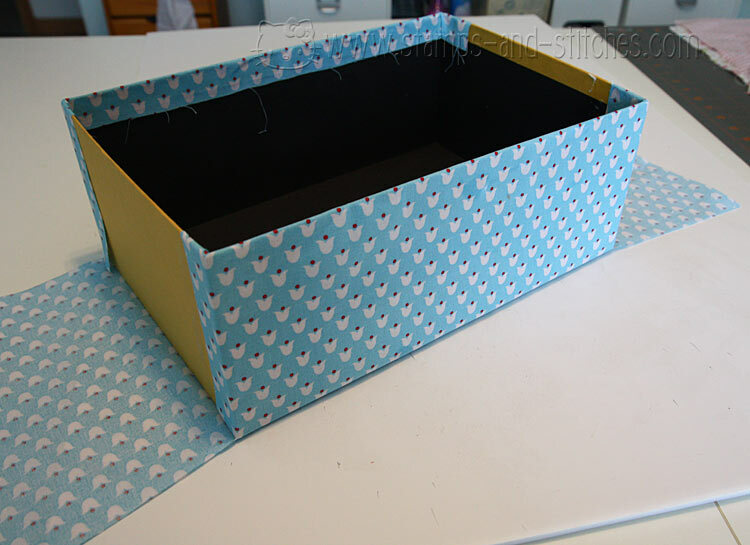 Today I'm sharing a couple of storage ideas. 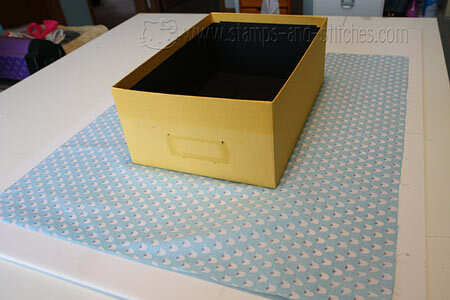 First is my 6 x 6 patterned paper storage. When Stampin' Up started selling these, I thought I had to have every one, and multiple pads of each. I haven't even used much of it but now I will (hopefully) since it's nicely organized. 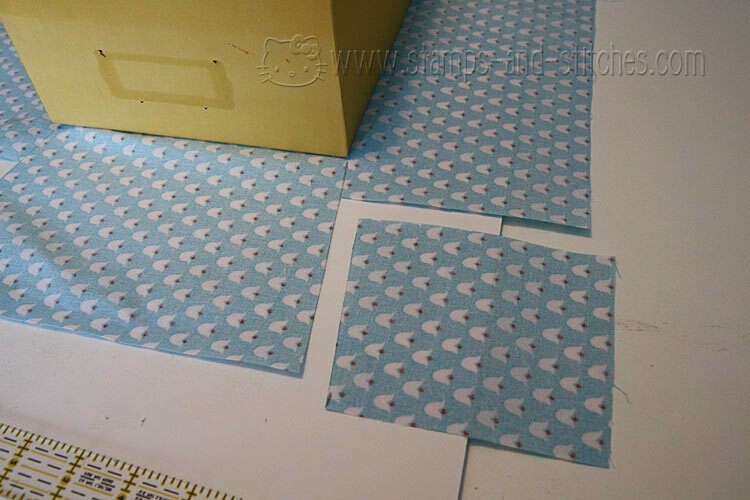 The first thing I did was make some mini file folders using some regular folders cut down and my envelope punch. Then I took my paper pads apart and filed each color in a separate folder. 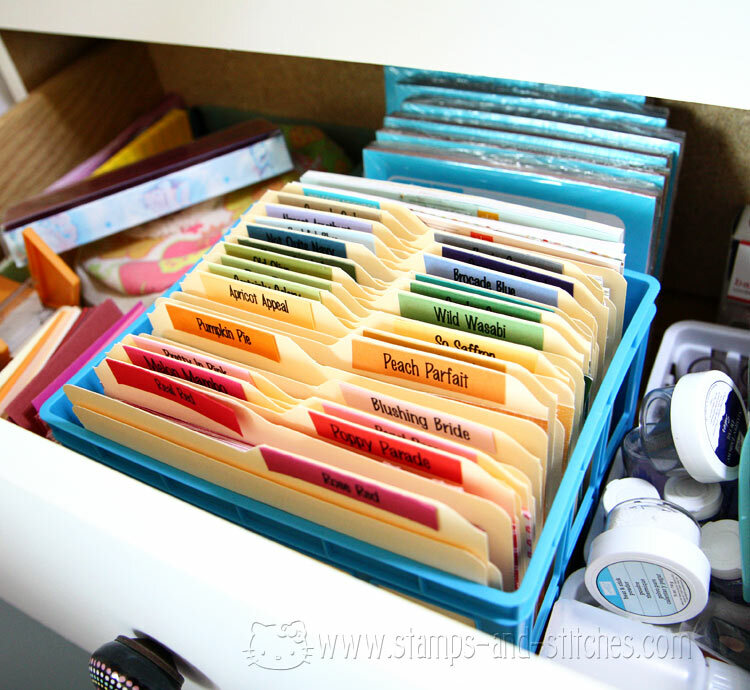 I had some spare file folder labels that I had for my cardstock so I used them for these. I only did this with my SU paper packs because the others ones I have don't really have any dominant colors. I kept those in their pads and turned them upside down for now so the scraps can stay in the pad. The whole thing is stored in a cd case from Walmart. I love how this turned out. You can see all of my unopened pads in the back. With any luck these will get used now. Here's some of my other storage. This is a Making Memories shelf where I keep my ribbon, buttons, paint and some other stuff. On the bottom shelf the ribbon spools were too big to use with the dowel in the middle, so I tied it (with some ribbon) to the front to create a little stopper thing. Then I just set my larger ribbon spools behind the stopper thing. 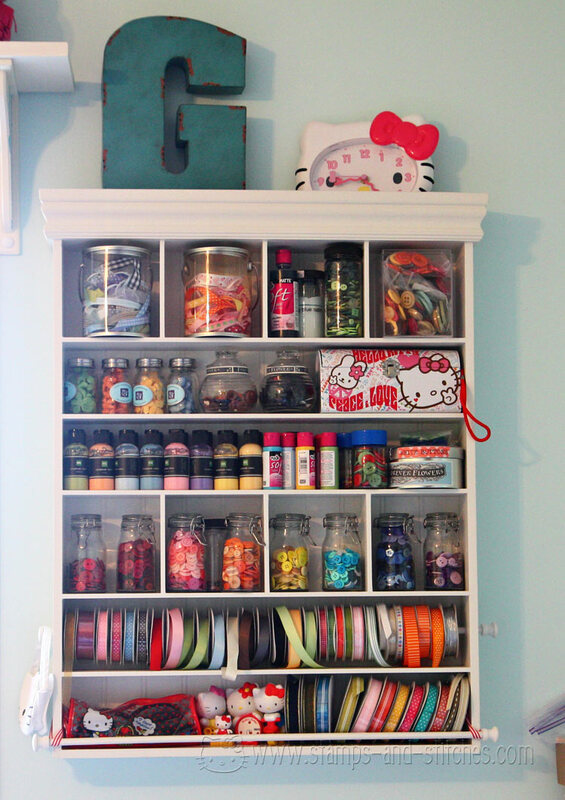 The rest of my ribbon spools are on the next shelf up. The jars and tins hold my buttons and the jars near the top on the left have some paper flowers in them. 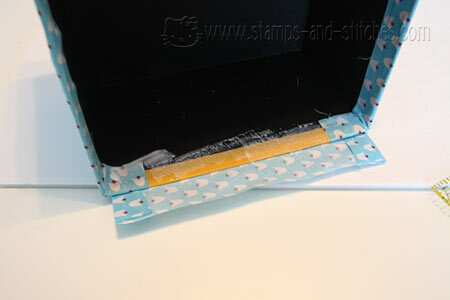 The clear paint can looking containers on top hold small pieces of ribbon. The long tin holds my Stampin' Up markers (I don't have many) and the little pouch on the bottom holds my rubber cutting scissors. Also on the bottom-some of my McDonald's and Lego Hello Kitty collection. Click here for a link to my other ribbon storage. I keep my non-spooled ribbon on foamcore boards and almost 7 yrs later, it's still working out great for me! Here's a quick and easy tutorial to cover standard sized photo boxes with fabric. I used fat quarters from Stampin' Up for these, which are very generously sized fat quarters. I don't even think they can legally be called a fat quarter. With regular ones be sure they will fit over the photo box. 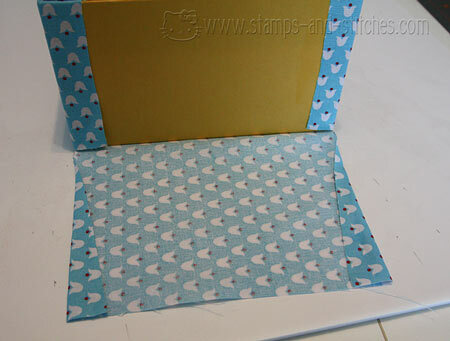 You should be able to cover one box bottom with a single standard sized unwashed fat quarter. If it's been washed, it may have shrunk so be sure to check the fit. You'll also need a fat quarter for the top. 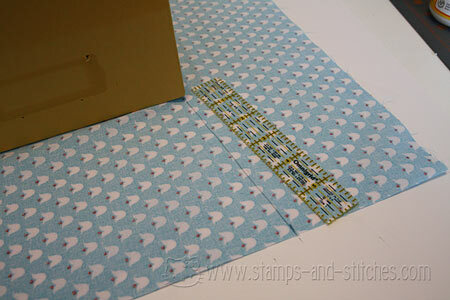 I was able to do two tops per fat quarter but again, these Stampin' Up ones are much bigger than normal. Mod Podge is also necessary for gluing on the fabric, along with an applicator (I used a foam brush). Before you start, remove any hardware from the box. Mine had label holders that I had to pry off. 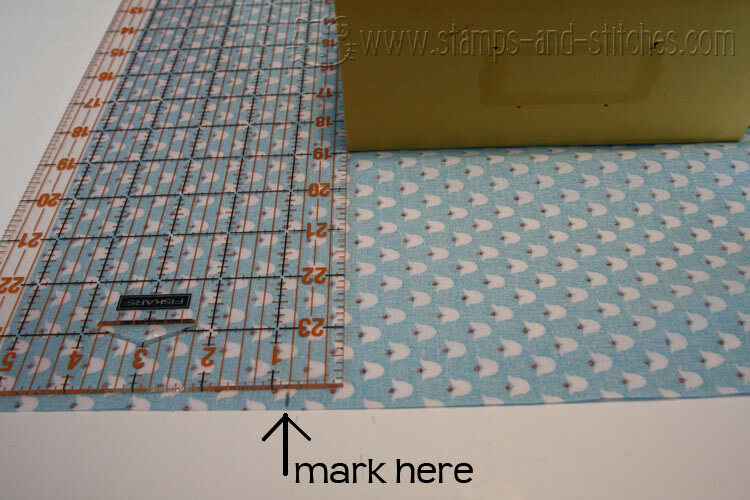 Step 1: measure your fabric if necessary. 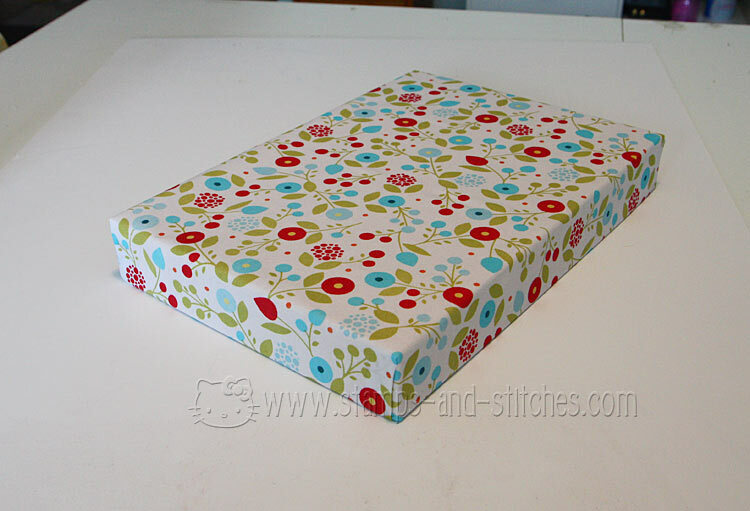 Make sure it will go around the box and overlap by about an inch on all 4 sides. Same with the top. Cut off any excess. 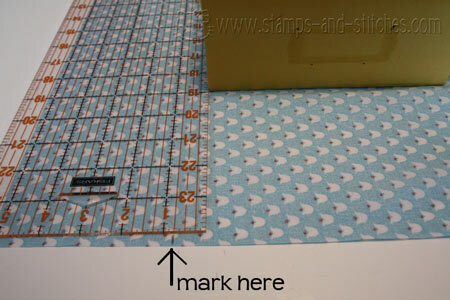 In this picture I'm measuring only the length of the fabric. Then I checked the width. 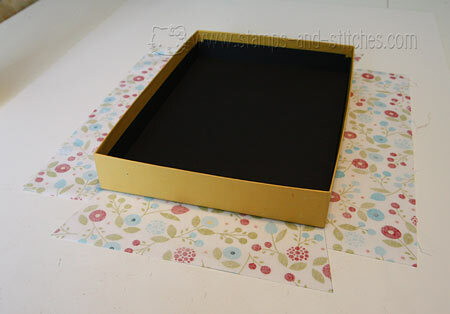 Step 2: brush glue onto the bottom of the photo box and place it on the center of the fabric. Step 4: draw a line from the corner of the box to the mark. Step 6: Brush glue onto the long sides of the box (one at a time) and fold up the sides. 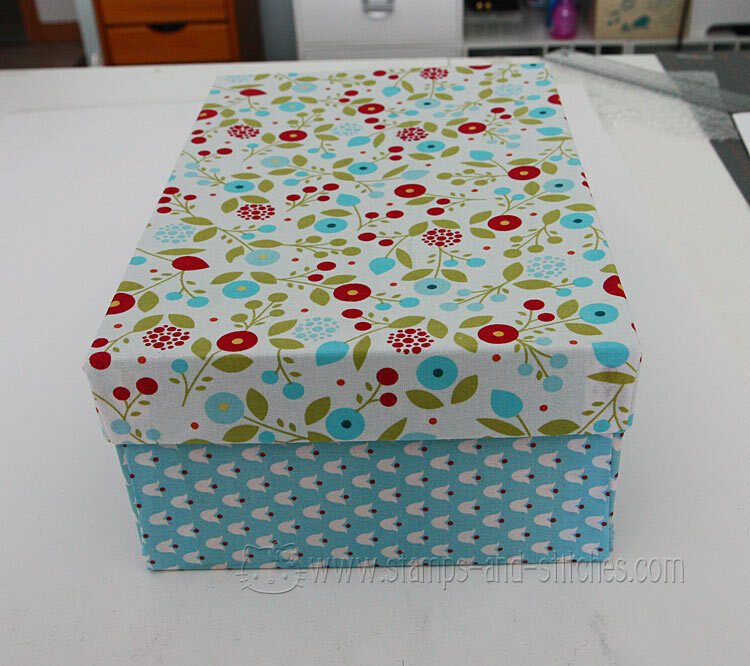 Be sure to apply glue wherever the fabric will lay, including inside the box. Fold the fabric to the inside of the box and glue it down, keeping the corners as smooth as possible. 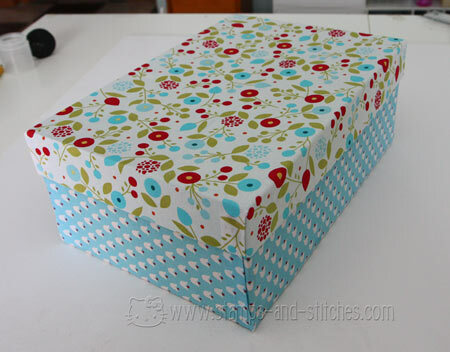 Step 8: apply glue to the box ends and fold up the fabric ends. 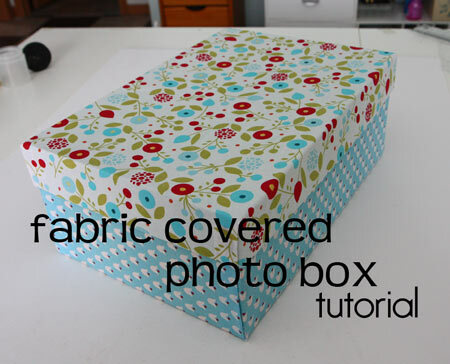 Be sure to glue inside the box and fold over the excess fabric. Make the lid the same way but be sure to measure 1/2" in step 3 instead of 3/4". 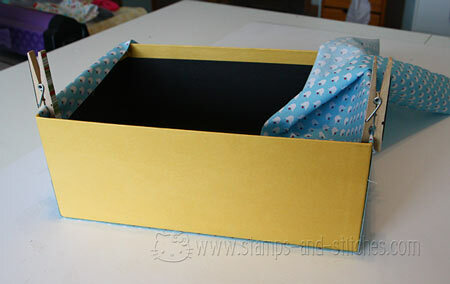 Also, be sure the corners are as smooth as possible on the inside so the lid will fit on the box. 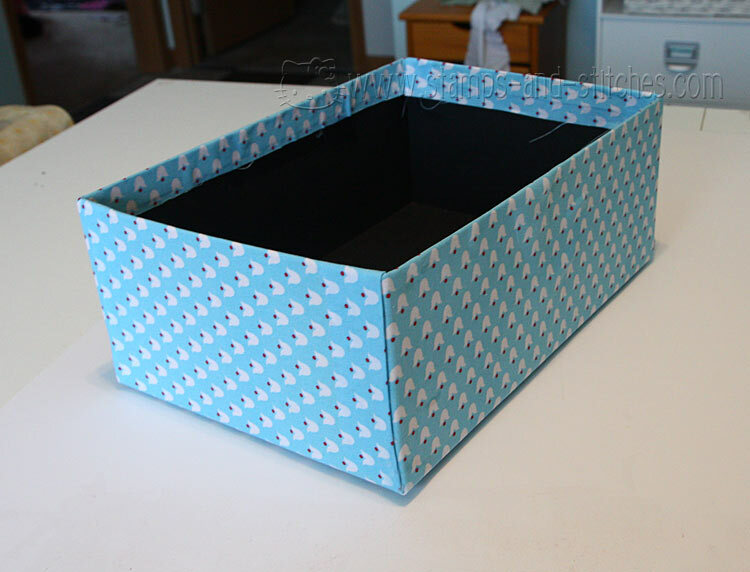 And here is the finished box, complete with tight-fitting lid. hint: I hate washing dried mod podge off my hands, so I wear disposable rubber gloves when doing the gluing part. Also, be sure to let the glue dry thoroughly before putting the lid on the box. Otherwise you may never get it back off.